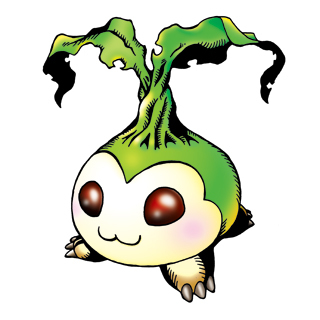 A Bulb Digimon which has something that looks like a plant sprout burgeoning from its head. It is a Yuramon that wandered in search of an optimal environment, then settled to the ground and evolved. Due to its extremely timid personality, if it senses an intruder's presence, it will burrow with the four feet at the base of its body, and completely bury part of its body in the ground. Once it is completely hidden underground, the thing growing from its head assumes the camouflage of a plant, allowing it to defend its body from intruders. However, this is ineffective against herbivorous Digimon. n., Tane 「種（タネ）」 means seed. Awa  Bubbles 泡 N/A Bubble Blow/Bubbles Shoots a series of pink bubbles from its mouth at the opponent. Tanemon is the partner of Tachikawa Mimi. 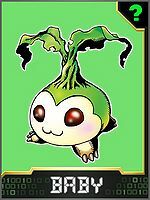 Tanemon is an obtainable Digimon in Digimon World and evolves from Yuramon after 6 in-game hours have passed, with no necessary conditions required. Tanemon appears as a NPC in the Village of Beginnings behind Jijimon's House where she manages a Meat Farm, giving 3 pieces of Meat to the Player each day. 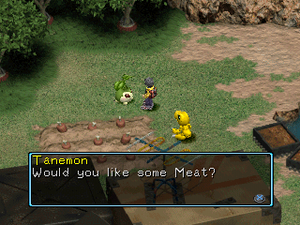 Once the player has recruited Palmon she'll upgrade the Meat Farm by giving Giant Meat instead of the regular one, and Tanemon will no longer work, residing in a planter. 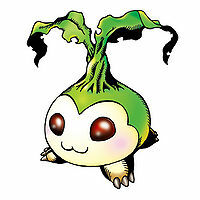 Each 15th day of the month Tanemon will plant a Rain Plant in one of the planters as its necessary to recruit Vegiemon. 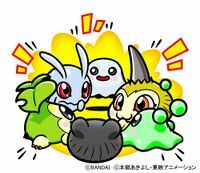 Palmon by having a higher MP, Speed or Brains stat than the others. Betamon by having a higher HP, MP or Defense stat than the others. NOTE: Due to a bug in the game, sometimes Tanemon won't evolve into either Palmon or Betamon even after the time requirement has already elapsed. This is due to the fact that unlike the other Baby II Digimon, both of Tanemon's evolutions share a higher stat requirement, in this case being the MP stat. This alludes the game to look after the second highest stat, but if its the Offense, which neither Palmon nor Betamon have as an evolution requirement, keeps preventing Tanemon from evolving. This bug can be fixed by raising any of the other stats or by simply going meeting Kunemon's evolution requirement. Tanemon is given away by a NPC in the Tanemon Rental Event. It evolves to Mushmon at Lv 11. Can evolve to Palmon, Lalamon or Renamon. 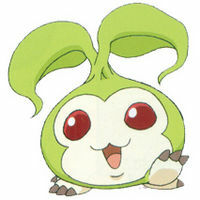 Tanemon is an obtainable Data Baby-Level Digimon and belongs to the Jungle Troopers Field. Evolves into Palmon at Level 8 with no other conditions. Evolves into Alraumon at Level 14 with a minimum Experience Stat Total of 1100. Evolves into Floramon at Level 12 with a minimum Insect Experience Stat of 100. All 3 Digimon can degenerate back into Tanemon at Level 3 with no conditions. 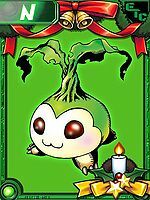 Tanemon can appear as a wild Digimon at the Chip Forest at Level 4. Tanemon evolves from Nyokimon, Bubbmon or Yuramon with passing time and evolves into Floramon with 20 Insect/Plant AP, Mushmon with 3 penalties, Alraumon with 3 after battles or Palmon with passing time. It can be caught at Slippery Swamp. Tanemon is an special available Mercenary digimon being classified as different evolutionary levels. There is no difference between its forms minus increased stats. It can also be summoned with a special card in which is referred to as "Mutation". Evolves from Yuramon. Can evolve to Piyomon or Palmon. Tanemon is a partner Digimon. Evolves to Palmon. This page was last modified on 6 April 2019, at 05:46.